Bradley Cooper Plays "Egg Russian Roulette" with Jimmy Fallon -- And It's Hilarious! Bradley Cooper isn't afraid to get messy! The actor stopped by "The Tonight Show" on Friday, where he took on host Jimmy Fallon in a game of "Egg Russian Routette." The rules are simple: each player had to smash eggs against their head from a box of a dozen eggs, that contained eight cooked eggs and four raw eggs. This is the first time the late night host has played the egg-tastic game on "The Tonight Show." 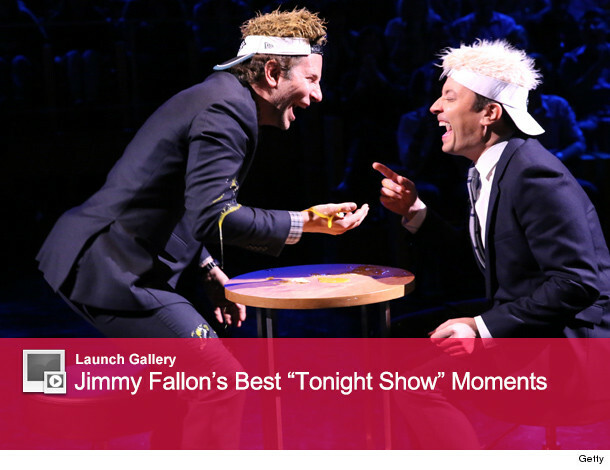 When he hosted “Late Night,” Fallon played the game against Tom Cruise, David Beckham and Edward Norton. So, who ended up with egg on their face? Check out the video above to see these two in action! Emma Stone Plays "Box of Lies" With Jimmy Fallon -- And It's Hilarious!